A lone hiker takes in the view of the Shenandoah valley while resting from a long days hike on the Appalachian Trail. I usually refrain from including people in my landscape work but while we talked he pulled out his I-Phone and began taking pictures of the view. I'm thinking "Those are not going to do this view justice! ", so when he finished and sat back down I asked him if I could take his picture while he enjoyed the scenery. I explained that it just seemed right to include someone who was hiking the trail in a shot so he sat there as I fired off a few frames. I then handed him my card and told him to email me when he got back home and I'd send him a copy. He looked at the card and then said "So you DO know what you're doing." To which I replied "Occasionally." We both laughed and continued talking for the next few minutes while he put his gear back on. He was spending the night on a warm, dry bunk in the Bears Den Hostel and was really looking forward to it after getting snowed on earlier in the week. This is the Bears Den Scenic Rock Overlook situated on the Appalachian Trail in Clarke County, Virginia. The lodge is about 200 yards up the hill from this location and they have a campground and accommodations in the lodge. Hiker bunks run $15 a night or you can go for the "Hiker Special", at a whopping $27, which includes a bunk, shower, laundry, pizza, ice cream and soda. I'm not kidding! A welcome change for trail hikers from sleeping on the ground and eating freeze dried whatever. 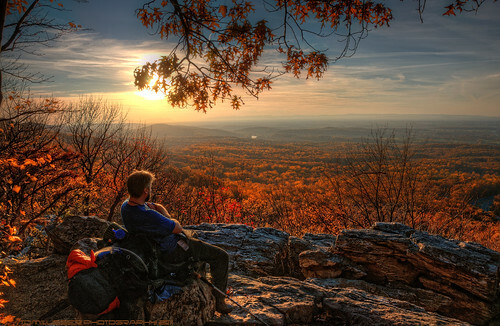 Bears Den Trail Center is owned by Appalachian Trail Conservancy (ATC) and managed by the Potomac Appalachian Trail Center (PATC). ATC and PATC have developed a strong working relationship to provide for the long term future of Bears Den as one of the premier hiking trail centers on the Appalachian Trail. And please don't use my images without my consent.